I went to college at Caltech, where the typical collaboration policy is very lenient, encouraging students to work together on the homework together. Accordingly, there was a clear correlation between how well I learned the material in advanced math classes and the number of friends I had in the class to work with. Sophomore year, my room became a homework center of sorts as me, my roommate, and our friends collectively worked on a couple dozen classes’ worth of homework. Senior year, when I went to take graduate-level analysis, I happened to be the only undergrad in the class, and I was lost enough that I dropped the class after the first quarter. 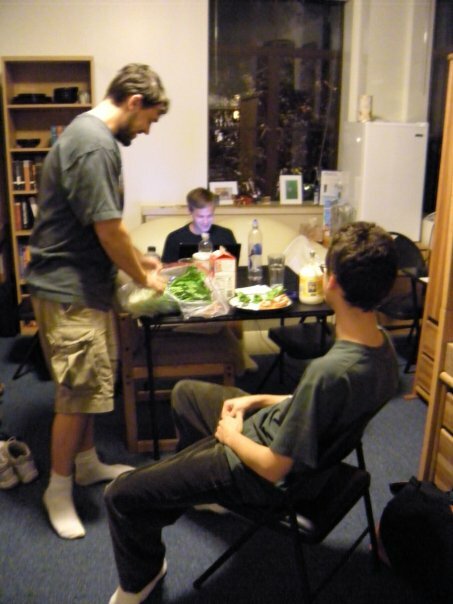 Working on my laptop in my sophomore year room, as my roommate Chris White prepares something to eat on the left, and neighbor Chris Bilinski lounges in the front. The loveseat, card table, and extra chairs made our room a great place to gather and work together on homework. Photo courtesy of Nina Ng-Quinn. It became a bit of a truism among some of my friend groups that late-night discussions over problem sets would be what we remembered most from our classes. While I’m not sure that’s exactly true, working together would help all of us to understand the problems better as we explained them to each other. We’d face a greater risk of distraction and sometimes take longer to do the work, but we’d also more often come out having learned something from each other. As a tutor at Caltech, and a TA at both Caltech and MIT, I’ve had a lot of opportunities to help students on their homework. In many of these instances, though, the students don’t need continuous attention. If they were stuck on a problem, I could get them unstuck, but then they wouldn’t have another question for me until they worked on that problem a bit longer. Another difficulty is that students often have the same questions. If they each ask you in turn, you’ll have to answer the same question multiple times. Noticing these downsides, I started to try to get students together for office hours or tutoring on the same class all at once. At one point, I was tutoring seven students together who were all taking my favorite chemistry class. I’d work the room, bouncing from student to student who had questions as they worked through their homework. I wouldn’t get paid seven times as much, but I’d be much more helpful collectively than I would have been tutoring one-on-one. I took the same approach with office hours as a TA. In order to maximize my usefulness, I’d choose the time slots that were most convenient for students, frequently the day before the problem sets were due. It worked, and I generally succeeded in getting a lot of students would come, allowing me to help them all at once. With a big enough crowd, I would start by asking everyone which problems they needed help on by a show of hands, and then go through the problems from the most popular to the least, describing the main difficulty in each of the problems and offering a hint or a starting point for them to work from there. In most classes I’m familiar with, every TA is required to hold weekly office hours, which means that most are this awkward in-between where maybe one student comes and you have to bounce between your own work and helping that student. But if I were in charge of one of these big classes with many TAs, I would consider having only a couple of the strongest ones hold well-timed office hours and give the rest of the TAs other responsibilities to compensate, like grading tests. There is some need to help students who have unusual schedules, but it’s also a lot more efficient and (let’s be honest) fun to gather students together to help them all at once. When I decided to go into math rather than chemistry (my second major) for graduate school, the one aspect of chemistry research that I knew I would miss out on was the group community. Naturally, experimental work often involves students who need to share resources and work on very related projects, so it makes sense to gather for a weekly group meeting to update everyone on your work. In my first research experience at an organized program in Duluth, MN, I got a taste of what that might look like in math. Students would give 10-minute talks each week to each other, Professor Gallian, the advisers, and any visitors that week. These talks gave the students a natural weekly check-in, encouraged them to have something to show for their week, and gave them a good opportunity to ask questions of the room. A couple of years ago, I noticed a trend of more and more students in the MIT Math Department working on problems related to machine learning theory. I gathered us all together along with a couple of the professors in a conference room to discuss our recent research, and we’ve been meeting ever since. The format has evolved over the years, generally with us giving more informal and shorter updates as time has gone on. Another helpful boost has been moving the meeting to lunchtime and ordering food, the eternal graduate student motivator. But beyond that, I think we’ve continued to meet because the meetings are genuinely helpful, giving students like myself without a lot of close collaborators more frequent designated chances to talk to others about our work. And here’s my moonshot idea. The arXiv is an immensely helpful online preprint publishing website widely used in many areas of math, physics, and computer science. Its purpose is to speed up the exchange of ideas, allowing researchers to post their work before the review process is complete. However, in almost all cases, this exchange of ideas is still mostly unidirectional. As in, people read the papers posted on the arXiv, but the paper’s authors don’t usually hear much about it. I’ve only once had the good fortune of being contacted about one of my papers, by someone looking to extend a key probabilistic lemma of mine (which they were indeed able to do using some fancy probabilistic machinery). It generally seems such communication is generally quite rare; you post the article, and then never hear from anyone about it. Sometimes papers posted to the arXiv also have mistakes, usually small and fixable, but occasionally more substantial. Most authors I think would be happy to learn about those, and I’m sure that occasionally someone will e-mail them. But it also doesn’t seem like it happens that often. Besides, e-mail suffers from the same difficulty as office hours: what if multiple readers have the same question? To making this exchange of ideas actually happen, then, I’d like to propose adding a comment system to the arXiv. Each article would have corresponding message board or thread, where readers with verified arXiv accounts could add questions, comments, random thoughts, or whatever they want. To minimize overhead, authors could be given ownership over the comments on their article, with the ability to delete hurtful comments and block harassing users. Users could set notifications to send them e-mails whenever articles they write or choose to follow get comments, like any social media platform. This type of feedback would make academia friendlier, or even feel actually existent in the first place. Think about it: Most of the time, the first time you interact with anyone (outside of your advisor or collaborators) who’s read your work, it’s a grumpy reviewer. That can be incredibly depressing: You spend months and months doing the work and writing it up, and the first reaction you get is both important and negative. Even if you do succeed to get it published and maybe give a talk at a conference, it might not generate any real discussion beyond a cursory question during the allotted time. An online comment system would allow for more extensive, considered, distant, and asynchronous communication. This already happens in some contexts like Terry Tao’s blog, but adding it to the arXiv would open it to everyone. All four of these suggestions would take a typically individualized or 1-on-1 task in academia — doing homework, office hours, research updates, and publishing — and add a communal aspect to it. All allow for some gains in efficiency, but more importantly, they build a sense that you as a student or researcher aren’t on your own; you have friends and colleagues to turn to for help when you’re stuck, and to cheer your progress along the way. And that’s a message that I know a lot of academics need to hear.